It’s a terrible feeling. You drive up to your home after being gone all day or from a short vacation and find a river of water running down the driveway. Did a water pipe burst? Probably not. The number one source of home flooding is a broken washing machine hose. Most hoses are nothing more than reinforced rubber. Yet they sit behind the washing machine under full pressure for years. Some will give you a warning when they develop a bulge, but few people even check them. 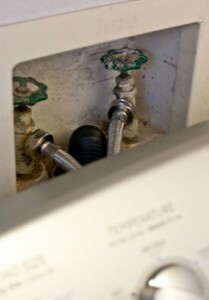 Check the hoses on your washing machine regularly. Even better, invest in reinforced or flood-proof hoses. Reinforced hoses are encased in braided steel or other materials that help prevent them from blowing out. Flood-proof hoses have a built-in valve that detects uncontrolled running and cuts off the flow of water. Save yourself the nightmare and tens of thousands of dollars in damage.